When Carl Brashear joined the Navy after the end of World War II, he ventured into territory that had up until recently been the exclusive domain of white men. Being the uneducated son of a dirt-poor black sharecropper from Sonora, Kentucky, the Navy only offered him three career prospects-- become a cook, become an officers' valet, or leave. However, Carl wanted to become a Navy diver more than anything else, and he devoted every waking moment to realizing that dream. Unfortunately, despite President Truman's order to integrate all military services, the Navy was still an inhospitable place for a black man, and Carl faced more than his fair share of racial discrimination and harassment. 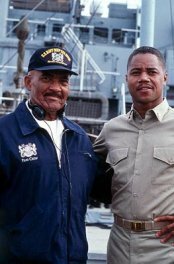 "Men of Honor", the sophomore effort from director George Tillman, Jr. ("Soul Food"), is based on Carl's decades-long struggle to overcome these obstacles to become an accomplished Navy diver. For the most part, "Men of Honor" is an engaging biopic, similar to last year's "The Hurricane", that is marked by two terrific lead actors and an inspirational story. Unfortunately, "Men of Honor" also tries to cover a little too much ground in its 128-minute running time, and falls apart in the final act, where genuine drama gives way to mawkish melodramatics. 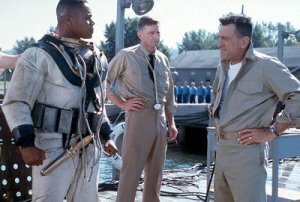 The story starts in 1943, when Carl Brashear (Cuba Gooding Jr. of "Jerry Maguire") joins the Navy for what he hopes will be a lifelong career that will make his father proud. Instead, he finds a racially-charged environment onboard the USS Hoist, where the black men are relegated to menial tasks and are only allowed in certain areas of the ship on certain days. However, Carl proves himself to be a strong swimmer, which catches the attention of Captain Pullman (Powers Boothe of "U-Turn"), who in turn makes him one of the ship's Search & Rescue swimmers, and ultimately recommends him to Navy diving school. When Carl arrives in Bayonne, New Jersey to attend diving school, the bigotry he faces grows tenfold. In addition to harassment from his peers, who refuse to bunk with him, Carl also receives abuse from his instructor, Master Chief Billy Sunday (Robert De Niro of "The Adventures of Rocky & Bullwinkle", who plays a composite of the many bigoted officers that Carl faced in the early days of his career). Sunday is an unabashed redneck, with his hatred towards blacks running deep, and he is determined to make sure that Carl does not graduate, a task that has the full support of the school's eccentric commanding officer (Hal Holbrook of "The Bachelor"). Fortunately, Carl does not face his obstacles alone. In addition to sympathy and support from fellow trainee Snowhill (Michael Rapaport of "Deep Blue Sea"), Carl finds love in the form of Jo (Aunjanue Ellis of "Girls Town"), a medical student who offers him assistance to pass his written exams. For the most part, "Men of Honor" works on the strength of its two principal characters and the performances of the actors who play them. Carl and Sunday are two characters on similar trajectories, as they both have a love for diving and excelling in their duties. Whereas Carl is driven to exceed what others expect of him, Sunday is driven to maintain the status quo, both in his personal beliefs and in the high standards that he sets for his students. Unfortunately, what Sunday doesn't realize is that he is as much of a victim of discrimination as Carl. However, somewhere along the way, Sunday is able to recognize this, thereby overcoming his own prejudices and recognizing the talent and potential of Carl, who is probably his best student. From this recognition of ability comes respect, which ultimately brings the two otherwise contrary men together. Cuba Gooding Jr.'s performances have always been marked by enthusiasm and an earnest intensity, and this film is no exception. In "Men of Honor", he channels this zeal to deliver a credible and moving performance of a man whose tenacity is boundless. 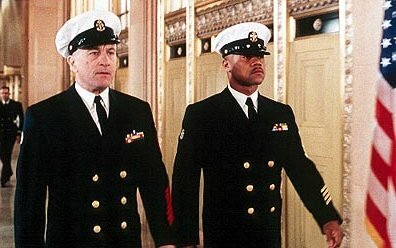 De Niro, as Sunday, masterfully handles the 'softening' of his character, whose arrogance and resolve at first blinds him to what Carl has to offer, only to become his greatest assets when he sees Carl's promising talent being threatened by Navy bureaucracy. The supporting cast pales in comparison to these two lead roles, with the most criminal example being Charlize Theron ("The Legend of Bagger Vance"). As Sunday's long-suffering wife, Theron's character serves no purpose, other than to seemingly add some color to an otherwise male-dominated cast. Rapaport fares a little better, playing a stuttering bunkmate who pays a serious price for making friends with Carl. Ellis, who does a decent job for most of the film, stumbles a bit in the final act, though it seems to be more a function of the script than her acting ability. If there is any fault with "Men of Honor" it would have to be the film's prolonged and unnecessary third act. "Men of Honor" would have been perfect had it tightened its focus on Carl's struggle in diving school, ending on the high-note of his 'final exam' in the dark, cold waters of New Jersey. However, the Scott Marshall Smith-penned script packs in enough material for two movies, making the film's final third, which deals with the actual events of Carl's life after diving school, feel tacked on. As a result, "Men of Honor" feels longer than it actually is, as the story loses its focus as it tries to wrap up this new trajectory. Unfortunately, the writing suffers here also, with the characters spouting clunky dialogue that seems more at home in a soap opera (especially a key scene between Carl and Jo), and the drama becoming unnecessarily heavy-handed and emotionally-manipulative (similar to how the ending of "Pay It Forward" ruined an otherwise good film). Despite its flaws, "Men of Honor" still deserves an honorable mention. Inspiring and entertaining, it is similar to last year's "The Hurricane", as it is a film based on the true story of one man's determination to excel and the barriers of racism he must overcome to do so. Despite some stumbles in execution, its intentions are noble, as "Men of Honor" is a testament to the courage and perseverance of a man who wouldn't take 'no' for an answer.